There are plenty of butterflies around this summer including some spectacular Peacock butterflies. 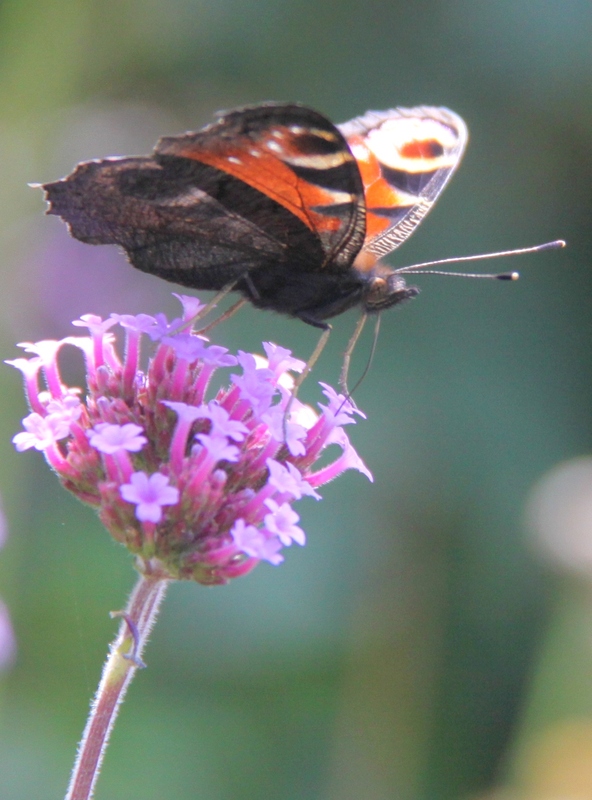 They like hedgerows and woodland edge type habitats and will happily visit your garden to feed on some of their favourite garden plants such as Buddleja and Verbena which have many tiny tubular flowers arranged in clusters. Peacock butterflies lay their eggs on nettles and hops which the young caterpillars eat when they hatch. So if you’d like to see more of this butterfly try allowing a patch of common nettles (Urtica dioica) or a Hop vine (Humulus lupulus) to grow in your garden. As a child I thought that all butterflies lived for just a few short weeks in summer. In fact Peacock butterflies live throughout winter. They find a place to hide during the cold months of the year. Their closed wings are very dark and look like dead leaves so are the perfect camouflage.